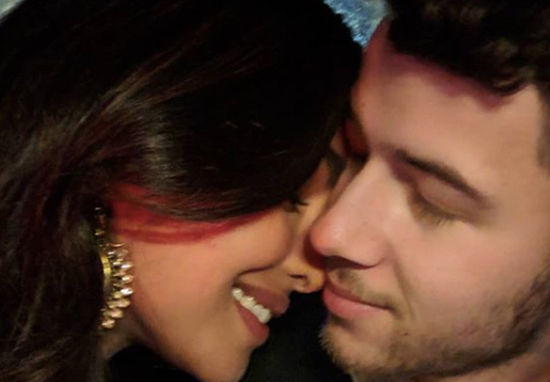 Forget the royal wedding, Nick Jonas and Priyanka Chopra’s glittering Jodhpur ceremony has blown people away, and now the happy couple have shared pictures of their special day. New photographs from five-star wedding venue – Taj Umaid Bhawan Palace – show 36-year-old Priyanka looking breathtaking in a custom-made Ralph Lauren gown, complete with an incredible two million mother of pearl sequins. With a tulle veil flowing a staggering 75 feet behind her, the Bollywood star looked straight out of a fairytale, and the detail was incomparable. The one-of-a-kind gown was embroidered and beaded by hand, and also included numerous meaningful touches. Priyanka had chosen eight words to be stitched into the fabric, which held special significance for the couple; including the words Compassion, Love, Family and Hope. The Hindi mantra ‘Madhu & Ashok, Om Namah Shivay’ was also stitched into the dress. A piece from her mother-in-law’s wedding dress was also sewn into the gown, giving a touching nod to the family history of her new in-laws. However, the opulent dress, which took a reported 1,826 hours to complete, was just one of two lavish gowns worn by the former Miss World during their weekend-long wedding celebrations. As reported by Hello!, Priyanka wore the pristine white Ralph Lauren piece for the Christian ceremony, which took place on the Saturday (December 1), with an equally perfect gown worn the following day during the Hindu ceremony. During the second ceremony, the bride wore a traditional Indian two-piece outfit, in a rich shade of ruby red. The dress was designed by Sabyasachi Mukherji, and sparkled with jewels and exquisite sequin work. Priyanka paired the achingly gorgeous dress with precious pieces of gold jewellery, as well as a diamond headpiece. We are taking beautiful traditions that we both grew up with and we are personalising them in a way that makes sense for us. It’s been incredible to find the commonalities between our beliefs and figuring out how to blend them in a respectful and meaningful way. 26-year-old Nick made a strikingly handsome groom, looking every bit as stylish as his beautiful new wife. For the Christian ceremony, the singer-songwriter wore a sleek black tuxedo by Ralph Lauren with custom dress shoes. Nick also brought deeply romantic and sentimental details to his outfit. A piece of bridal lace was stitched to his lapel, embroidered with the Urdu words ‘My Jaan’ which means ‘My Life’. For the Hindu ceremony, Nick wore traditional Indian clothes; with a golden turban and sherwani paired with matching shoes. The emotions were running high during the ceremonies, I think especially during the Western wedding for me. You know, you think your whole life about that moment. Honestly, I could not have imagined it would be as perfect as it was. It was highly emotional. @priyankachopra IS THE MOST BEAUTIFUL BRIDE EVER! Congratulations to the happy and beyond fashionable couple!